Ah . . . fall. The beauty of changing leaves, pumpkins, apple orchards, and hayrides. Fall is also the time in many of our congregations that we hold our stewardship campaigns and set our mission and outreach budgets for the coming year. 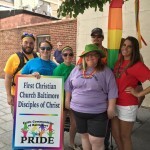 As your Development Team Leader, I am encouraging your congregation to make the Disciples LGBTQ+ Alliance a regular part of your mission and outreach giving. Your regular, ongoing congregational giving will support the Alliance’s important work of setting a place at the table for persons of all gender expression and sexual orientations. In this month’s Crossbeams newsletter you saw our moderator’s recent letter on the Alliance’s stand against the ‘erasure’ of our transgender siblings in the United States. We want to continue to offer this support to your justice work. And Mark is finishing a busy year of presenting workshops, Building an Inclusive Church Toolkit trainings, and working with the many Open & Affirming Ministry Teams doing important work in our regions. Also, with Mark’s announced retirement next year, we plan to continue our O&A work and expand our justice work, to provide yet more trainings, to train new trainers, and to hire an Executive Director of the Alliance (not just the Open & Affirming Ministry Program) who can expand our intersectional justice work. There are many important new initiatives that the Alliance Council is working on, and next year’s General Assembly again opens opportunities for the Alliance to spread the message that All Means ALL. Of course, staff, booths at General Assembly, travel and time for workshops and training, and time spent on the phone supporting our Regional Open & Affirming Ministry Teams costs money. So far this year, 14 of our 173 O&A ministries have given to the Alliance. We’d like to see that increase to 25 by year end, and more in the new year. We need your congregation to make a regular pledge of financial support in the coming years. Some of our congregations give to us on a quarterly basis. Some pass an offering plate and send us the proceeds. Some churches do this once a year when they celebrate the anniversary of their O&A commitment. Some do this monthly. Surprisingly, some of our smallest churches give the most. We are grateful for every contribution. You can help by talking with members of your church’s board, to your pastor, and if you’re a member of the board, talking with the board about your commitment to spread welcome beyond the doors of your congregation. You can see a report on congregational giving in last year’s Report to Membership. Only together can we, the members of the Alliance, work to build a church where are ALL welcome at the Table.